Magazines purchased in SkinMagz.com are AVAILABLE ONLY ONLINE! How do I read my magazines? Just go to SkinMagz.com, and log in to your account. Then go to My Library to access all your purchased magazines. When you find the one you want to read, just click on the cover image to start reading. Magazines purchased and delivered through SkinMagz.com are available only online. Can I read my magazines on my Mac and PC? Yes at SkinMagz.com, you can read your magazines on any device: PC, Mac, iPad, iPhone, Android and more. Android users may download ANDROID APP in our Android help section. Can I view magazines offline? Yes, you can view magazines offline in SkinMagz Android APP. iOS users (iPad, iPhone) may view offline magazines by saving magazine to home screen. When do I get my next issue? This depends on the magazine's publishing schedule. Generally, a monthly magazine will be available one month from the last release date. SkinMagz.com offers both back issues and current issues. Back issues are always available. If you feel you have missed an issue, please contact customer service at cs@skingmagz.com for assistance. Upon purchasing a subscription, the latest issue of the title, which you have subscribed to, will immediately appear in your library. Upcoming Issues will appear in your library as they are published, the frequency of which depends on the publisher. After your subscription is fulfilled, SkinMagz will NOT automatically renew the subscription and charge your credit card; to renew the subscription you need to place it in you shopping cart and make a purchase..
SkinMagz.com is a distributor of digital magazines. The publications that we deliver can be viewed on your computer, tablet or smartphone and are AVAILABLE ONLY ONLINE. SkinMagz.com does not deliver magazines that are printed on paper. What happens if I have multiple accounts with SkinMagz? Please contact us at cs@skinmagz.com and our customer service team will merge your accounts and notify you went it has been completed (within 10 business days). How can I request a refund? Please contact customer service, at cs@skinmagz.com, to request a refund. We will gladly refund the unused portion of your subscription however we will not refund single copy purchases. Once the issue has been viewed we consider it is accessed and therefore not subject to refund unless there are technical issues with accessing the issues, in which case we will seek to resolve those before issuing a refund. How does the search feature work in Skinmagz? 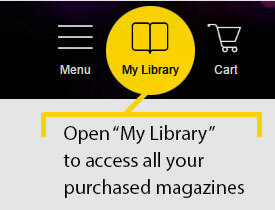 You can search for a specific magazine title within your library or search the entire newsstand. You can even search for your favorite model's name or topic. Happy hunting! WE DO NOT SELL NOR DELIVER HARD COPIES. Create an account and get your five (5) free magazines. All your favorite adult magazines--now for iPad, iPhone, Android APP and on the web! 2000+ of magazines 100s of titles. The shopping process is safe and offers secure communications by encrypting all data to and from the site. © 2012-2019 Blue Light Media, llc. Adult Digital Newsstand. All Rights Reserved. All models were 18 years of age or older at the time the photographs or videos were taken. © 2012-2019 Blue Light Media, llc. All Rights Reserved.